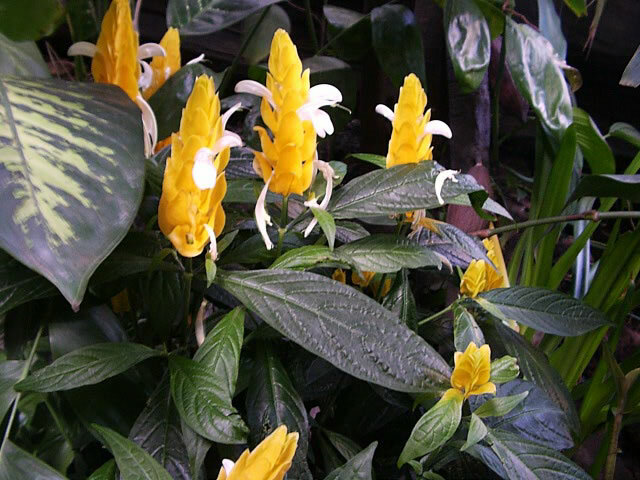 Golden Shrimp Plants are also known as Golden Candle plants or Lemon Lollipop Flowers. 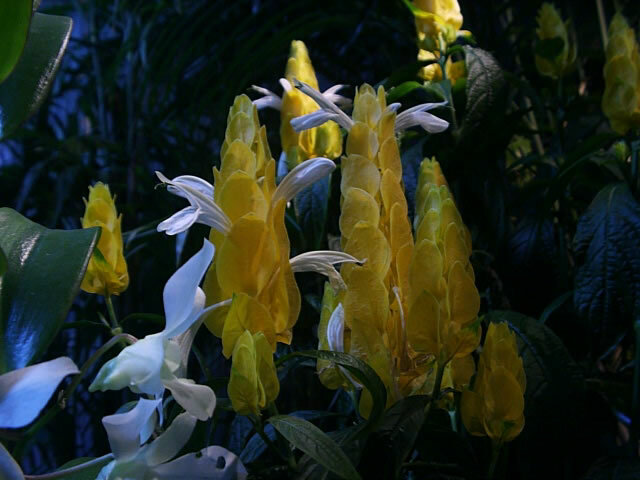 They are 18"-24" tall, shrubby plants that form clumps of upright stems that are each tipped with brightly colored, 4" golden yellow bracts that are adorned with small, creamy white flowers. The flowers are short lived, but the bracts will last for many weeks. They have deeply veined, lance shaped green leaves that grow to about 6" long. In zones 10-12 where they are hardy, Golden Shrimp Plants are popular as landscape plants that bloom nearly non-stop all year. In cooler zones they are sometimes grown as annual plants, but are more often grown in pots or planters and kept as house plants. In the garden, Golden Shrimp Plants should be planted in full sun to partial shade. They should be grown in slightly acidic, fertile, well-drained soil. Prune back hard (by up to a half) in early spring, to induce branching. Golden Shrimp Plants are exotic and beautiful additions to any house plant collection. Indoors, they will grow best when they are kept in a draft free area where they will receive full sun in the morning and bright, indirect light during the remainder of the day. They bloom best when daytime temperatures are 65°-80° during the growing season, but are happy with 55° during the winter months. Keep the soil evenly moist, using room temperature water that has been allowed to sit for 24 hours so that chlorine or other harmful chemicals have dissipated from it. Reduce watering in the winter. Mist the foliage frequently during the summer months, using room temperature water. or feed monthly from spring through fall with a balanced, soluble fertilizer. Golden Shrimp Plants should be repotted and pruned back yearly, in the spring. Use a good quality potting mix that has a high perlite content to ensure good aeration and drainage. Pachystachys are prone to attacks from mealy bugs, as well as scale and spider mites, so be sure to inspect your Golden Shrimp Plant for these and other pests before returning it indoors after summering in the garden. semi-ripe cuttings taken from non-blooming shoots in late spring or early in the summer. Provide additional humidity for the cuttings by enclosing the pot with a plastic bag over a wire frame, or keeping the cuttings in a terrarium until they are well rooted and growing. Keep them in bright, indirect light or under fluorescent grow lights. Remove dead leaves from the cuttings promptly!